Poetically painting pictures, vocalist Jon Philpot of the psychedelic Brooklyn rock group Bear in Heaven has been honing his craft for years — but he is only now starting to see his own big picture. After plenty of a positive response to its latest album, Best Rest Fourth Months, the group recently returned to the studio. SF Station spoke to Philpot in a phone interview while he was working on new material at a recording studio in New York. 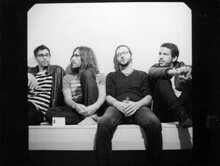 Bear in Heaven performs at Rickshaw Stop on July 26th. SF Station (SFS): Best Rest Fourth Months was not the original name of the album, what was it? Jon Philpot (JP): I wanted it to be “West in Peace.” I just wanted to make it something goofy, but I got to call a song “Beast in Peace,” so I feel happy now. SFS: How far along are you on the new album? JP: The new album is coming along slowly. We just got a chance to start writing recently. SFS: Do you write most of the lyrics, or does the group write collectively? JP: As far as the band, I’m pretty much the only lyric writer. My friend Michael has been helping me with lyrics. It’s been really nice to correspond over email about lyrics. We used to skateboard together when we were younger, and now we’re exchanging poetry. SFS: How did that come up? Did you write poems about skateboards? JP: I came down to play in Atlanta and he came to the show. He was amazed by the show, and decided he wanted to give me some lyrics — and he did! Now he’s helping me out when he can. It’s my full-time gig so I’m doing the majority of it. SFS: So you started playing when you were nineteen, and now are making it “big” at thirty-five. What kind of odds and ends jobs have you had to support yourself in between? JP: I worked at a coffee shop in Athens, Georgia called Jittery Joes, which actually is a really good cup of coffee if you are ever in Athens. Then I went into video. SFS: Was there ever a point where you decided to choose music over video, or has video always been a means to an end? JP: Well the two are kind of simultaneously running for me. The thing is I’m kind of torn because there is not one that I like more. Right now, music is yelling at me a little louder so I have to focus on it for a little while. SFS: Visuals can translate into your music. JP: Absolutely, as I make stuff for video, or as I make stuff for music, the two kind of inform each other. Narrative, characters, and having stuff like that to me it’s very important in lyric writing, and also in the way it progresses cinematically. SFS: From a lyric standpoint, do you start with a visual, literal idea, or does it start with an abstract thought? JP: I usually pick an idea, and then the metaphors come with that. It’s a lot of speaking about specific people, and the specific things that they’re doing and then trying to describe it poetically. SFS: I noticed that in your lyrics you use a lot of visual imagery — mountains, rocks, or birds. What do they mean to you? There is a theme of nature, you might say. JP: It’s a connection between us and earth, our surroundings. I was just trying to make things bigger than what I can actually make happen, or see in reality. SFS: Like bears in heaven? JP: Well, I haven’t been to heaven. All the elements in the songs are just minutia that I think is important. It’s important to give them their time and space, and they’re all a part of it. There is a big connection to the nature and human relationship on this record particularly. SFS: Are you a nature person? JP: I do love nature, yes. SFS: Are you a bird watcher? JP: My dad is a birdwatcher. It’s kind of weird that you asked me that, because my dad is really a bird watcher. SFS: If you could be a bird, what bird would you be? JP: Shoot, that’s a tough one, probably a falcon or something that’s pretty radical. SFS: That’s a vicious bird. What would you be doing if your music hadn’t caught on? What he said was, “What you have is fans — people.” Oh yeah, I guess I never really thought about that. 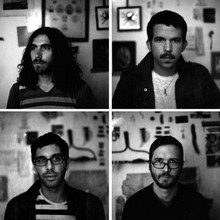 Bear In Heaven performs at Rickshaw on July 26th. Tickets are $10 in advance, and $12 at the door. Doors open at 7:30pm.